These buildings were originally built as the School Building (including the Memorial Wing), the Boarding House and a separate Pavilion Classroom for the Perth High School, later renamed Hale School. The High School, established in 1878, was originally located in the former Barracks at the top of St Georges Terrace (the Barracks Arch) and the old Pensioner Guards Hospital which was across the road on George Street. The main school building was built first in 1914. Designed by the Government’s Chief Architect, Hillson Beasley, at the time of its completion it was considered a modest yet substantial Gothic style building and of a high standard of architectural finish. The site, too, was considered a prime location with fine views over the city and beyond, and sitting in amongst other prestigious civic developments such the Observatory, Parliament House and Kings Park as well as some of Perth’s finest residences. The playing fields were across the road in Kings Park, though tennis courts were built in the school grounds and also a rifle range which was used by the school’s Cadet Corps. Other buildings to be added later included a Gymnasium, a Science Block and also the Memorial Wing – built to honour those students who had served in the First World War. For the first 10 or more years, the boarders were still housed at George Street until new Boarding House was built in 1926 on the high ground at Harvest Terrace end (overlooking Parliament House). In 1929, to honour Bishop Hale who is held as the founder of secondary education in Western Australia and also to coincide with the State’s centenary of British settlement, the school changed its name to Hale School (though it would be another 30 years before it would become Church of England school). The West Perth site had always been considered small from the beginning, and with student numbers continuing to grow, a location for a new and large school complex was secured in Wembley Downs in 1938. However, the outbreak of war and the frugalities of the post-war years would mean that the new school was considerably delayed. In the meantime, a separate brick and tile Pavilion Classroom to the rear of the Assembly Hall was built in 1944. Hale School remained at West Perth until 1958 when the new school was finally completed and the students were relocated. The Education Department then used the school complex as its main headquarters from 1963 until 1983 after which it was occupied by the Distance Education Centre. Since 1997, the Constitutional Centre has been located in the main school building, and in 2012 the old boarding house was altered to accommodate new offices for the Premier and Cabinet Services, including a new Cabinet meeting room. The main changes that have been made to the old Hale School complex has included the demolition of the freestanding buildings including the gymnasium and science block as well as the ablutions and armory and other minor buildings and also the tennis courts. Other than some internal refurbishments and modifications, the remaining school buildings are still largely in-tact. The Main School Building and Boarding House in particular are important examples of the scholastic style of architecture of these two periods and now rare examples of this building type in the State. Although there were some public and private schools in Perth in 1872, there was growing agitation from the Perth community over concern about the lack of accessible higher educational opportunities in Perth for boys – especially those from prominent well-connected families. By 1876, the Government finally agreed to establish a new High School, and the High School Act 1876 was gazetted and a board of Governors formed to establish the school. The new school was to be modelled on the English Public School System which required that the headmaster had to be a graduate of a university but as not to be a minister of religion as the school was essentially secular, although optional “scripture classes” were acceptable. In 1878, the Perth High School for boys opened, initially in temporary premises in a house on St Georges Terrace and then later at the Barracks at the top of St Georges Terrace and the old Pensioner Guards Hospital across the road on George Street. In its early years, the High School like most schools in the colony struggled to maintain student numbers. However, from the 1890s, aided by the gold boom prosperity and population growth, it started to experience some stability and optimism for its future, ably led by its headmaster F. C. Faulkner. Sport was always an important part of the High School’s culture particularly the traditional English sports of cricket, rowing, fencing and soccer, although this was extended to include Australian Rules Football, boxing and tennis. In desperate need of playing fields, in the early 1890s the Government offered the school land in Havelock Street, West Perth. However it was decided to build the new Perth Observatory on that land and so the Government instead offered some adjoining land to the west, but because of its slope it was considered unsuitable for playing fields and was rejected. As a solution, the school was granted some land at Kings Park which they took up in 1896. 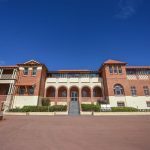 Although it was better than having no fields, the Kings Park location would eventually prove inconvenient as it was a long trek uphill from the school premises on George Street. Having a new school built up near Kings Park was seen as a solution. Again the Government looked to the Observatory site but this time the Government Astronomer W. E. Cooke opposed the proposal on the grounds that the boys would be too noisy for the quiet contemplative work carried out at the Observatory, that the buildings could obstruct the meridian line from the Observatory and that it would prevent the Observatory from future expansion. However, by 1900 Cooke reluctantly agreed for the school to be built on the land to the west of the Observatory. Ironically, this was much the same land the school had originally rejected for its playing fields, but as a location for a school building it was considered more acceptable. By this time, the Perth High School had essentially become an “exclusive boys’ school”. This exclusivity was further cemented when in 1912 the Government removed the cap on fees that the school could charge. The High School therefore attracted students from the more privileged and economically prominent families. The Old Boys’ Association and the Board of Governors in turn attracted and comprised of powerful and influential men both within the boundaries of the school as well as beyond to the Government and the broader community. Although independent, the High School still received some support from the Government to build its new school both financially and in terms of access to the architectural division in the Public Works Department. Chief Architect Hillson Beasley supervised the design of the new High School, and the builder was A. T. Brine. 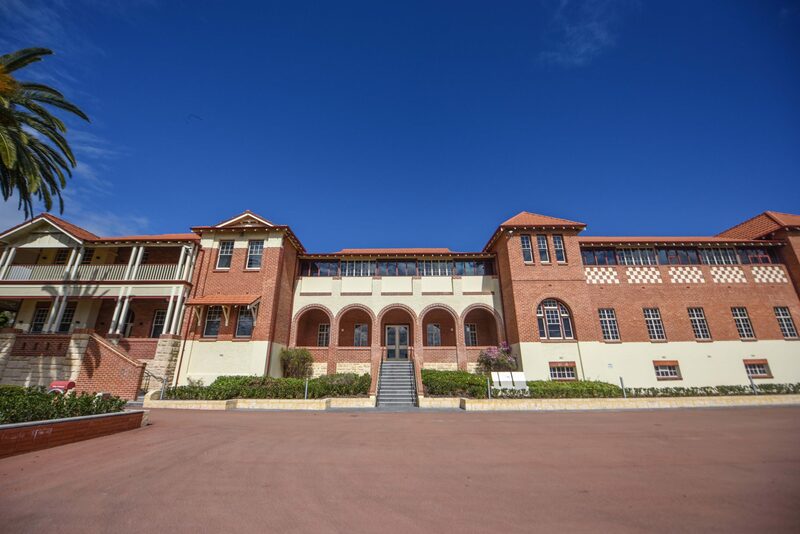 By September 1914, the Perth High School was finally completed and opened under new headmaster Matthew Wilson. The main school building comprised classrooms a headmaster’s office, masters’ common room and an assembly hall, and was built from Cottesloe stone, Donnybrook freestone, and facebrick with terracotta tiles cladding the roof. At the time of its completion the style was described as “scholastic Gothic” (which is now more commonly referred to as Federation Gothic) and while not lavish it was still considered substantial and of a high standard of architectural finish. The site, too, was considered a prime location with fine views over the city and beyond, and sitting in amongst other prestigious civic developments such the Observatory, Parliament House and Kings Park as well as some of Perth’s finest residences. The playing fields across the road in Kings Park were still used as the main playing fields after the school opened, though tennis courts were built in the school grounds and also a rifle range which was used by the school’s Cadet Corps. After 1915, Herbert Parry, who happened to be a former student, became the school’s private architect until the late 1930, and he would add to the school buildings as the student numbers grew. A freestanding gymnasium was added by 1916; in 1917 the new Science Block located at the back (south) of the school building was opened, and in 1921 a new east wing of classrooms was added to the main building and designed to mirror the architectural style of the east wing. It was known as the Memorial Wing to honour those students who had served in the First World War and financed with assistance of the Old Boys’ Association. For the first 10 or more years, the boarders were still housed at the George Street building until new boarding facilities were built at the West Perth site in 1926. The bungalow style two storey residential boarding house was situated on the high ground at Harvest Terrace end (overlooking Parliament House). With the widespread growth of other high schools around the State, the High School was starting to lose its exclusivity especially with its generic name. In 1929, to honour Bishop Hale who is held as the founder of secondary education in Western Australia and also to coincide with the State’s centenary of British settlement, it was decided to change the name to Hale School – not to be confused with Bishop Hale’s original 1858 school on St Georges Terrace (now called The Cloisters). The West Perth site had always been considered small from the beginning which ultimately prevented any further expansion even though student numbers were continuing to grow. There was also some rumblings from the parents of the boarders who were uncomfortable with a boarding school being so close to the city where temptations could too easily be stumbled upon. After some years of searching for a potential new location, in 1938 land was finally secured in Wembley Downs. However, the outbreak of war and the frugalities of the post-war years would mean that the new school was considerably delayed. In the meantime, a separate brick and tile Pavilion Classroom designed by Howard Bonner was built to the rear of the Assembly Hall in 1944, and an an armory (a weapons store) was also added a this time. Hale School remained at West Perth until 1958 when the new school was finally completed and the students were relocated. The foundation stones and memorial plaques originally placed at West Perth were also moved to the new school in Wembley Downs. The Education Department then used the school complex as its main headquarters from 1963 until 1983 after which it was occupied by the Distance Education Centre. Since 1997, the Constitutional Centre has been located in the main school building, and in 2012 the old boarding house was altered to accommodate new offices for the Premier and Cabinet Services, including a new Cabinet meeting room.